So what can you do with your dirty oily hair if the power is out for days? Use dry shampoo! :) It could also come in handy out camping, at the gym, etc. 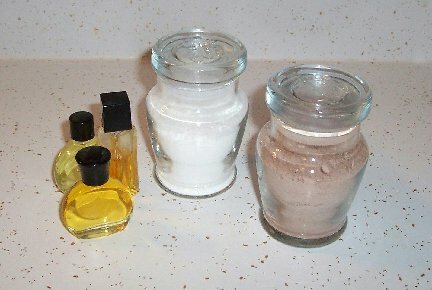 Store-bought dry shampoo can be very expensive $$$ but cost just a few cents to make at home and is super easy to make. You can simply use just cornstarch or baby powder or mix them with baking soda. A few other options people use are arrowroot, rice flour, cornmeal, ground oatmeal. You can try different combinations to find the one you like best or even equal parts of all the above. Blend the more coarse ones in a blender like the oatmeal and cornmeal until fine. You can even use regular flour in a pinch. It doesn't take a lot. It's better to start with a little than to have so much that it is hard to brush out. If you want it scented, just add a few drops of essential oils or a little perfume or you could add some ground dried flowers or herbs/spices. The scent will work its way through the rest of the ingredients after it sits a little while. Some scents people like to use are Lavender, Rose, Lemon, Coconut (nice for the beach! ), Peppermint, etc. I went with Mountain Heather. 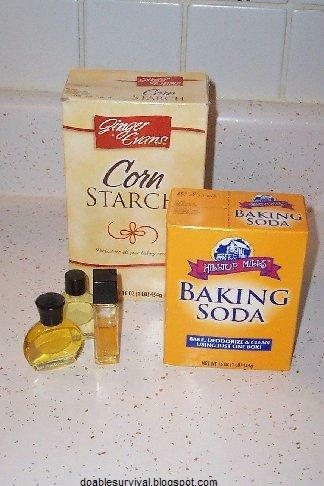 I used 1/2 cornstarch to 1/2 baking soda. A few drops of essential oil (optional). If you have darker hair and want something that is not so easy to see, use cocoa powder or even cinnamon. I've seen recipes for different ratios, so just play with it and use the combination or color you like. Some people use a 50/50 combination of the cocoa powder and cornstarch or 2 tablespoons of the cocoa powder to 1/3 to 1/2 cup of the cornstarch. 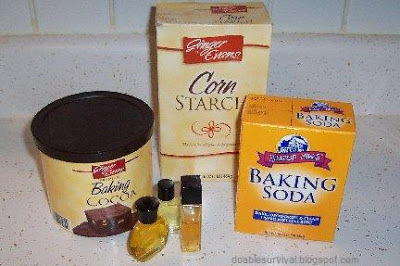 I used 2 Tbsp cocoa powder to 4 Tbsp cornstarch. An alternative to the dry shampoo is a spray that dries fast because of its alcohol content and cornstarch. 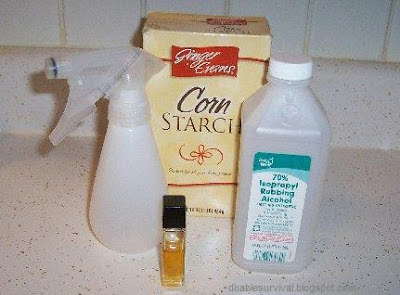 Just mix 1 Tbsp of cornstarch in 4 Tbsp of cold water (Cornstarch melts fast in cold water! I use it to make gravy.) and add 1 Tbsp of alcohol. Put it in a spray bottle and spray a little on your hair, mainly the roots, and work it in. Be sure not to get it in your eyes as it stings! I haven't personally tried this one yet. Isn't alcohol bad for your hair? It would be for an emergency type situation if I did use it though. I tried the make up brush with corn starch, it worked as well as products I used to purchase.